There is a generally well-known math query called “The Monty Hall Problem” that deals with the chances a game show contestant has to win a car placed behind one of three curtains and whether switching their original decision after one curtain has been pulled back will better or worsen their chances of taking home the grand prize. Basically, this problem proposes that behind three numbered curtains are two goats and a car, and the contestant chooses Curtain 1. If the host then reveals the prize behind Curtain 3 to be a goat, would the contestant be smarter to switch to the curtain that has not yet been in play or stay with their original choice? The correct answer is to switch, since the problem assumes that if their original chances of winning were 1/3, by knowing that one curtain is not the desired choice switching would then increase these chances to 2/3. Confusing, I know. It isn’t a coincidence that one of the most prevalent examples of this problem in pop culture is an early scene from the movie 21 that is used primarily to prove the main character’s intelligence. There is one additional assumption that we have to make to prove even further that switching is in this hypothetical contestant’s best interests; that the host of this game show knows what is behind each curtain and chooses which one to open accordingly. Thus, the opening of one curtain over another is not a random occurrence but rather a decision predicated on pre-existing knowledge that the host is privy to but the contestant is not. Many who attempt to solve The Monty Hall Problem ignore this information, therefore arriving at an incorrect answer or not understanding why the correct one makes sense. Which brings us to the relevance of this crazy problem to this month’s discussion. 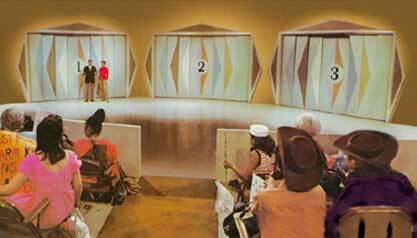 The Monty Hall Problem was named after the original host of Let’s Make a Deal and is the most indicative example of why two things; why Deal is so different from many other classic shows, even while portraying itself as a light-hearted studio show not much different than The Price is Right and the general issue of people marginalizing a show’s host or discounting them as fanfare and comic relief all together. That’s just the thing though, Deal can brand itself as whatever it wants to but as The Monty Hall Problem proves and close analysis of the show will reveal in reality it is one of the most unforgiving mindfucks of a game show that television has ever seen. This isn’t to say Deal isn’t entertaining to watch or somehow evil at its core, there are no explicit bad intentions at work from producers and the network. But unlike the majority of other game shows that rely on audience participation and contestant self doubt, Let’s Make a Deal is slightly more difficult to win and manipulative towards all involved. And the host has a lot to do with this feeling. Both the rebooted Deal airing in the hour before The Price is Right and hosted by a “I finally found my niche outside of 90’s comedy hours” Wayne Brady and the original long running program on NBC in the 60’s and 70’s come across as not quite mean spirited but not quite as uplifting as you expect a game show that gives away crazy prizes and large amounts of cash would be. For starters, the studio audience is dressed in crazy outfits simultaneously outlandish and embarrassing. Instead of endearing the viewer to the participants as it should, this just comes across as an inside joke that is awkward to watch and confusing in nature. Furthermore, the gameplay in general is alternately haphazard and torturous for the viewer. At least The Price is Right uses their studio audience in an organized fashion. Get chosen. Bid against three other people to come on stage. Compete in a random game that you are nonetheless familiar with. Use the audience for help and either succeed or fail. Rinse. Repeat. Deal makes it seem as if everything is random and no one knows what to expect next. Sometimes this can be a good thing, but most of the time it comes across as a train wreck set on a studio back lot. 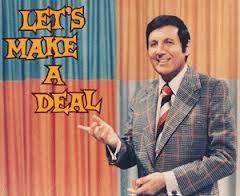 There are a variety of deal categories that Deal was known for, but they all centered on the show’s main conceit of making a fairly simple deal. Although most of the time this could be confusing because you never knew what was coming it was entertaining on many levels as well. For one, even though there wasn’t really a reason that the audience was dressed in an adult-sized diaper or a chicken outfit or as a ballerina it was still hilarious to watch someone attempt to seriously consider a proposition while trussed up like it was Halloween on steroids in the middle of an ordinary day. Furthermore, the confusing aspect worked perfectly for anyone who was watching for only entertainment, rather than looking for any narrative arcs of contestants. No one was really striving for an end goal like a final round past the one deal they would make, making it the perfect show for people who were doing chores around the house or spending time with family and not giving it 100% of their attention. Which brings us to probably the most unique characteristic of Let’s Make a Deal compared to other game shows both throughout the 60’s and beyond, and what truly gave it the identity it has today. All of the contestants were only really competing against themselves (with the exception of one or two multi-participant mini-deals). True, they interacted with the audience and the host en route to making their choice, but there were no other competitors that had the opportunity to win if one person made the wrong choice. You either won or you lost, got a goat or a car, went home with a pencil eraser or a thousand dollars. At no point in the episode did a person have to go up against a panel of other people to prove their worth. Just them, the host, a couple of models pulling back curtains, and your own concerns over your choice. So here we are, back at The Monty Hall Problem and why it was really born from this classic and its contests. Just as people who are attempting to solve the problem seem to experience, every contestant goes through about four stages of crippling self-doubt about whether or not they’ve chosen correctly or if they’ve just thrown away an opportunity for a getaway trip to an island somewhere. It’s the sadistic side of the game show circuit that is only truly revealed here, where contestants have only themselves to blame. In almost every situation on another game show people can absolutely make stupid mistakes that cost them the big prize, but in those situations it is either subtle enough that no one sees that they could have locked it up or the contestant has the opportunity to blame someone else’s skills for their failure. Not so in Deal, putting the contestants in a place where they are repeatedly second guessing what they were so sure about only seconds before because it is only human nature to have concerns where they naturally shouldn’t be. The host is such a big part of this, mirroring how much of an impact he has on the problem as well. Monty Hall (still making guest frequent guest appearances as recently as this year) as well as Geoff Edwards, Bob Hilton, Billy Bush (let’s just forget about that reboot, shall we?) and the current host Wayne Brady, have all inhabited the most integral hosting role of any game show. This isn’t to say that other hosts aren’t more important by any means; Alex Trebek has cemented his place in history simply by being consistent above all else as he reads questions and answers out loud five nights a week. But with Let’s Make a Deal the host is in charge of instilling those seeds of self doubt that every contestant must go through for there to be any entertainment value worthwhile. It is probably most similar to what the tandem of Howie Mandel and the banker were tasked with on Deal or No Deal. Without strategically planted suggestions like “Are you sure?” or “Would you like to change your pick?” there isn’t any uncertainty, and it turns into someone swapping things in their bag for a couple bucks. Watching is only fun when there’s a chance someone will be taking home some livestock when in fact the host knows that there is a new convertible behind Curtain Number 3. This may be a cynical way to look at a popular and respected show that has been running for so many years in one form or another. I credit that to the fact that since there is something off about Deal compared to the rest of the game show landscape the any immediate reaction can only be looking at the differences and what stands out. The tone of Deal makes it surprising that there have been so many reboots. In a way, it is such a 60’s style because of the lack of narrative and the underlying mocking of the audience. Modern shows tend to be based around either a team accomplishing something or are ripped off from whatever question or challenge based idea came before. Let’s Make a Deal is neither, but Wayne Brady has elevated it to the 21st century mindset with sharper wit yet the same gallivanting through a studio audience with only a microphone and a wallet full of bills. Although you can compare individual pieces of Deal to many other game shows this is probably one of the few shows to stand alone, with a different sensibility and focus than anything else but still manages to have some fun in the midst of it all. 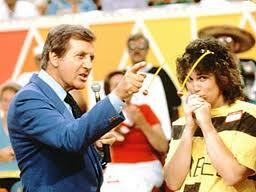 Let’s Make a Deal has aired on every major network except for fox. (NBC 1963–1968, 1990–1991, 2003; ABC 1968-1976; CBS 2009-Present). In 1974, this show had the longest waiting list for studio tickets out of any show on the air with a wait time of anywhere from 2-3 years after initial request for the chance to be part of the 350 person audience. It is estimated that Deal has aired over 5,000 episodes, but this cannot be confirmed for sure as NBC wiped most of the original tapes due to the high cost of video during the initial network run. The three locations outside of California that Deal has been filmed in at some point are Vancouver, Orlando, and Vegas (I would’ve paid a lot to see what the people in Vegas came up with for outfits). Whitney McIntosh resides in Massachusetts and is a recent graduate from the University of Connecticut. You can follow her on twitter at @whitneym02.